No more pussyfooting around! 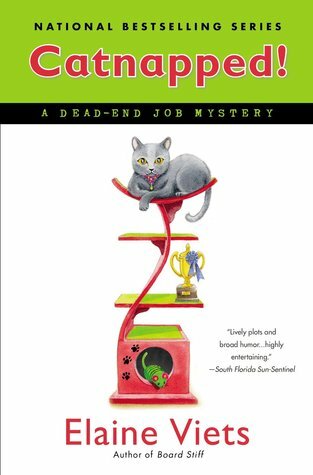 Husband and wife PI team Helen Hawthorne and Phil Sagemont have barely scratched the surface of the world of show cats when a cornered kitty kidnapper’s claws come out…. This show cat is a no-show…. The one thing celebrity Trish Barrymore and her no-account accountant husband, Mort, can agree on in their bitter divorce is shared cat custody. But when Mort is found brained by a mahogany cat tower, and Justine, their pedigreed Chartreux show cat, goes missing, Trish calls on Helen and Phil. Despite a ransom note from the catnapper, Trish is still the prime murder suspect in the eyes of the police. As they await the post-Mort-em, it’s up to Helen and Phil to find the feline filcher and let the cat out of the bag. Discovering that Mort had some shady dealings within cat show circles, Helen goes undercover as an assistant for a woman who shows prizewinning Persians. But Phil is not buying Trish’s cat-that-swallowed-a-canary act—he thinks she might be staging the whole catnapping. As Helen and Phil get deeper into a high-pressure world of primping, posing, and purring to collar a killer, they get caught up in a cat-and-mouse game where the stakes are literally life and death…. Each book is better than the last!! Phil and Helen had their hands full in this story. A catnapping, a murder or two, drama at the Coronado, and Helen learns all about cats and cat shows in her latest Dead End Job. Thankfully her cat Thumbs is pretty self sufficient as long as the food and water dish is full and the litter box is clean. There were really two plot-lines twisted together. This kept me as the reader very engaged. Margery, owner of the Coronado apartments, is always a very interesting character with the cigarette swirling around her head. In Catnapped! she gets a blast from her past that puts her front and center for most of the story. We also see how some kitty parents go a bit crazy about their pets. Most of us love our pets dearly and they become important parts of our families but Trish and Mort are just a bit out there when it comes to their beloved feline. The author has given us yet another wonderful mystery that takes us to sunny Florida to visit our friends at the Coronado. The residents there are like one big family. Their antics will make you laugh out loud, but they always have each others back. A “cativating” story that is fun and entertaining. A “Purrfect” Escape!! Elaine writes her novels with the help of Harry, a striped cat who sleeps by her computer and lashes the keyboard with his tail. He whips her into a writing frenzy. Harry collaborates on two series, the Dead-end Job mysteries and the Josie Marcus Mystery Shopper series. She’s won the Anthony, Agatha and Lefty awards. For more about Elaine check out her web site here. I have to catch up on this series. So many books to distract me. I agree each book in the series gets better. Great review, sounds like a fun read. I agree with you. Each book gets better and better! I really enjoy this series, and I always learn a little something too! Win, win. I love pets too!! And cats are my favorite, but when they become ” children” I have to wonder!!!! As a child advocate for abused and neglected kids , I wish there was a greater focus on taking care of these kids and homeless kids. Having said this, I really do think that a purring kitty can liven up any day. Would like to see how the cats are played out in this book !! Cute book cover. Sounds like a good series. Thanks for the giveaway. So glad you liked “Catnapped!”, Dollycas. Thanks for taking the time to review it. That’s my cat, Mystery, on the cover, drawn from photos by the Japanese artist Tsukushi. Kitty parents, crazy? Wwrapped up in their own world? Whatever would give you that idea? I follow several ways, FB, P, G+ for sure.